Those stepping up from beginner's cymbals will find the Xs20s noticeably nicer on the ear. For that extra timbral character though, you have to take the next step into the realms of really expensive cymbals. But for now these will do very well. Subtle sounds. Pro looks. A big improvement on the last Xs20s we tested. Crash lacks projection. Lacking in 'cutting edge' tones. The cymbals have a golden colour and are polished to a shining gleam, top and bottom. A lot of skilled effort is put into shaping, tempering and hand-lathing the cymbals. Most good quality budget cymbals are made from B8 bronze alloy, and European companies have made superb pro ranges using it. But Sabian always seemed a bit embarrassed by its own B8 ranges and in 2003 made the bold step of introducing a range made from pro-level B20 bronze at an intermediate price. The Xs20s have been a great success, and due to consumer demand Sabian now offers you the choice of Xs20s in a brilliant finish, as well as the original natural finish. "The thing that will appeal most to a drummer trading up to these Xs20s will be the refinement in tone." The difference between Sabian's B8 budget cymbals and its professional B20 cymbals lies not just in the higher tin content of the B20 alloy - it's equally in the mode of manufacture. The Xs20s go through the same sort of processes as Sabian's more expensive top lines. Sabian's B20 cymbals are said to be 'cast', referring to the fact that each cymbal is crafted from a single blob of B20 alloy rather than sliced out of a B8 sheet. A lot of skilled effort is then put into shaping, tempering and hand-lathing the cymbals. 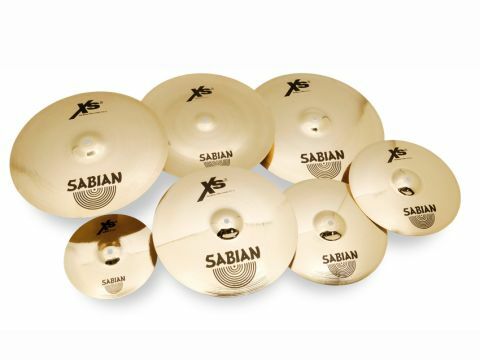 Sabian originally spent 10 years figuring out how to minimise this labour in order to bring in the Xs20s at an intermediate price. For those trading up from budget B8 cymbals, the look of the Xs20s should also be a big plus. They really do look like top professional cymbals. They have the golden colour of B20 and wide-blade, AA-style lathing, though there is no obvious evidence of hammering. And they are polished to a shining gleam, top and bottom. We reviewed the earlier version of the Xs20s back in 2007 and were somewhat disappointed. The tone of the cymbals was fine, but they lacked projection, particularly the heavier Rock versions. We risked them on a gig and had to change them in the break when the crashes failed to sustain and cut through. We were therefore keen to see if things had improved with this new lot. Well, in short, yes they have. Either we had a duff set last time or these are noticeably better. The refinement of tone which leads to a perceived softness remains. But somehow the overall sustain and projection have improved. There is a delightful warmth to these cymbals. The Medium Thin 18" crash and even the 18" china have a soft whoosh and depth - quite spongey, as though you are squidging into the cymbals rather than glancing off hard metal. The fact the china type is not harsh is a plus for us because it means it's not as aggressive as many other chinas. If you're looking for a raucous, barking china-type, this is not the one. It makes a useful alternative ride too - clear but not too coarse with its relatively mellow sound and modicum of trash. This understated quality didn't work quite so well with the smaller Medium Thin 16" crash which still suffers the most, projection-wise. Conversely, the subtle feel suits the 10" splash which is smooth and crisp, lacking the tinny brashness of some cheaper splashes. It also has quite a healthy sustain. Also coming out well is the 20" ride, which is a good all-rounder. The pitch is dark at the edges and rises to a warm, buttery, medium tone nearer the centre. Ride patterns enunciate clearly with a thickness to the stroke giving the depth and quality you associate with a more expensive cymbal. There's a feeling of gliding along on this smooth playing platter. The bell is balanced with the rest of the cymbal, having a distinct, clean jingle that doesn't jump out awkwardly. At medium weight the crash properties are well balanced too - the cymbal builds up a good roar, stopping short of washing out. The 14" hi-hats also have the warm sound which means that the closed 'tick' may be too muted and not edgy enough for some styles. Correspondingly the half-open splash sound is again not all that harsh or colourful. It is, though, quite deep and refined, with some subtlety and versatility. We witnessed these Xs20s used for a performance and from the audience the crashes and the hats cut through well. And for musicality the contrast with an old set of Sabian B8s was chalk and cheese. Cheaper cymbals can be shrill and unpleasant, so the thing that will appeal most to a drummer trading up to these Xs20s will be the refinement in tone. In fact it should come as a revelation: "Wow, these are so smooth, so easy on the ear." The downside of that is the slight lessening of cutting edge and projection so that the cymbals could appear almost bland to some.